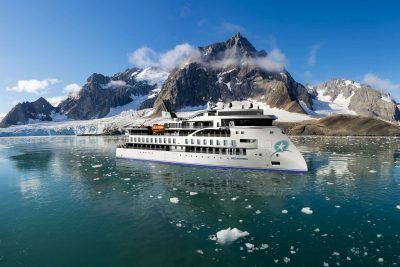 This incredible adventure cruise retraces Shackleton's infamous voyage, visiting Elephant Island before continuing south to the awe-inspiring icescapes of the Antarctic Peninsula. 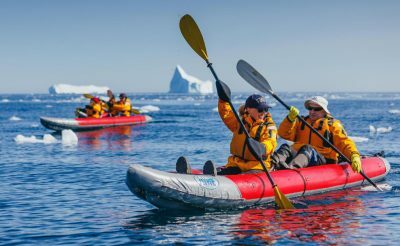 Days are filled with opportunities to see humpback and minke whales, penguins and leopard seals, along with a host of historic sites and scientific stations. Synonymous in the minds of many with Shackleton's heroic journey following the infamous Endurance Expedition, South Georgia is also home to a staggering volume of wildlife. 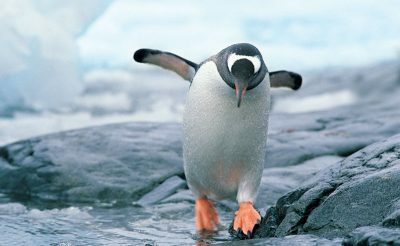 Literally millions of fur seals and penguins breed on this archipelago together with wallows of elephant seals and nesting albatross. This extraordinary expedition combines two of the world’s most isolated ecosystems. Participating passengers are treated to wildlife sightings not possible anywhere else on Earth. 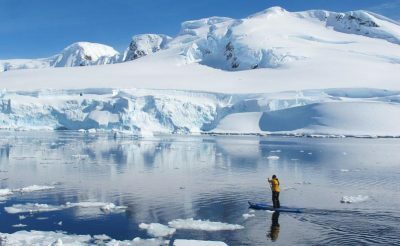 While the penguins, seals, whales and albatross may be seen as the main attraction, the abundant beauty and serenity of the wandering icebergs and imposing mountain peaks should never be an underestimated part of the enthralling experience. 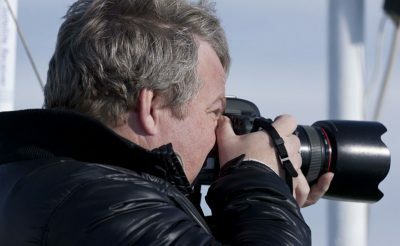 01 Dec 2018 18 days Polar Pioneer £13,769 - Waitlist only! 16 Jan 2019 18 days Polar Pioneer £14,538 - Waitlist only! 02 Feb 2019 18 days Polar Pioneer £14,538 - Waitlist only! 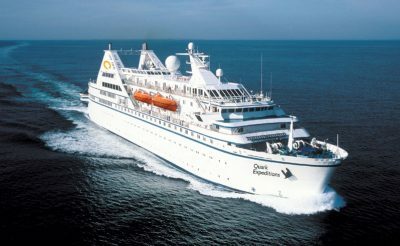 Prices are per person, based on a twin cabin - please contact us for details of quad, triple, single and superior cabins. Fly from Santiago or Punta Arenas, Chile to Stanley, and explore the historic Falkland Islands’ capital before embarking the ship in the late afternoon. 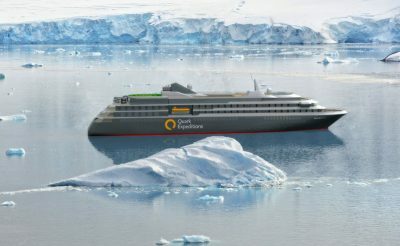 Between the Falklands and South Georgia you will be entranced by the ceaseless flight of the many seabirds that follow in the ship’s wake. The expedition team present safety and environmental guidelines and then you are free to keep watch for Shag Rocks, a fascinating group of jagged rocky islets protruding from the sea. Arriving in South Georgia’s spectacular northern coast you have ample time to explore the world’s largest king penguin rookeries and majestic albatross nests. 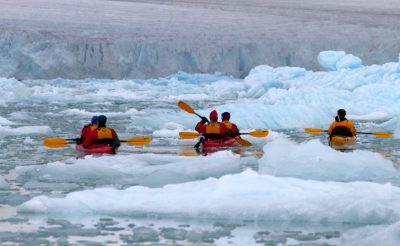 Those participating in the optional Kayak excursions revel in paddling the coastline’s nooks and crannies, accompanied by playful seals. In Stromness and Grytviken harbours, 3000-metre peaks form dramatic backdrops to the remains of whaling stations. 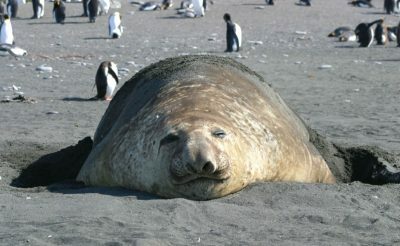 Kelp-strewn beaches are cluttered with basking elephant seals, feisty fur seals and penguins. Leaving South Georgia, head across the Scotia Sea in a south-westerly direction. The ocean takes on a whole new perspective once you are surrounded by the surreal presence of floating ice sculptures. Elephant Island is where Ernest Shackleton’s men wintered beneath their upturned boats on their historic expedition. With luck and weather permitting, you will go ashore to pay tribute to these hardy souls. Upon arrival in the calmer waters of the Bransfield and Gerlache Straits, you will aim to make landings or Zodiac excursions two to three times a day. 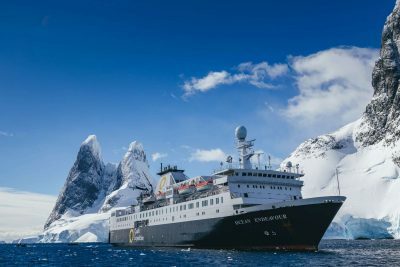 Time will be spent cruising along spectacular ice cliffs, following whales that are feeding near the surface and landing on the continent and it’s off shore islands, visiting penguin rookies and seal haul outs, as well as a few of the crews’ favourite spots on the Peninsula. Returning to the realm of the albatross. A time to celebrate and reflect as you head north across the Drake Passage. Disembark in Ushuaia, Argentina, where your expedition ends. 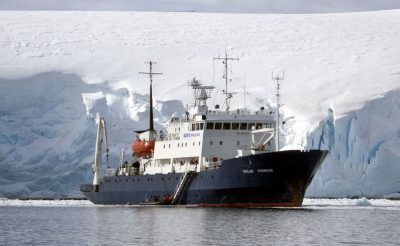 The above sample itinerary is based on the 18-day voyage on the Polar Pioneer. Other departures may vary in duration and routing, ie alternative embarkation or disembarkation ports, or do not include the pre-voyage hotel night. Please contact us for specific details.